You know that huge open space to the east of Highway 101 when you’re driving through Redwood City? That’s POST-protected Bair Island. Many of us just drive past this place, unaware that we’re passing the south Bay’s largest island. When it comes to Bair Island, as for other open spaces, there is so much more than meets the eye. These lands offer more than trails to explore and views to savor. To really get the whole picture, you need to go there with someone who understands the invisible powers at work. So we did! 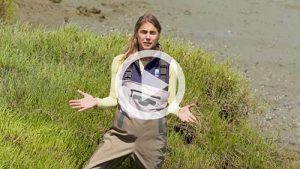 In this video, we take a trip to the island with Dr. Nicole Heller, our Director of Conservation Science. With her expertise, she was able to shed some light on Bair Island’s ability to absorb carbon from the atmosphere. We protected 1,623 acres of Bair Island in 1997. Soon after, we began work with the U.S. Fish and Wildlife Service to restore this critical wildlife habitat. It took some time, but in December of 2015, the final levee was breached and the life-rich waters of the Bay came rushing back to nourish the land. Hundreds of species of wildlife now call this place home, including numerous endangered species. It’s amazing to watch as one of the places we’ve known and loved comes back to life.